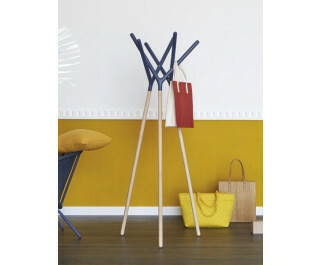 Obtained from the interweaving of three elements, the hanger is distinguished by outstanding design. Materials: solid wood. Colors: completely white or natural wood or with base in natural wood and top in lacquered white, red, yellow, green or black. Miniforms was born in Italy in the first 1970s as evolution of Inveta (Industria Veneta small tables), a company founded in year 1962 and producer of small tables and furnishing accessories. The end of the 1980s, Miniforms faces to the international market, expanding its production: are introduced the chairs, tables and bookcases, increasing the catalogue of new solutions for living. In year 2009 Mr. Luigi Bardini, Miniforms founder, sold the company to his son Mr. Alessandro, and Mr. Matteo and Mr. Mario, who now are investing in avant-garde production working with young talents of Italian design. The style to which inspires the company is close to the idea of a sober house, from authentic materials and in respect of the environment.The forms and colors are essential, clean and primary lines. The materials used range from solid wood to sheet steel, glass and aluminum, using environment compatible materials.